Every ghost has a different way of showing up. If you're a horror movie fan then you probably know a couple. There's the demanding ghost that draws people to come to them. This is that scene when a strange scratching sounds from the basement in the middle of the night, leading an inquirer to enter a dark staircase. Then there's the ghost that appears in reflective surfaces like mirrors and windows. The one that really gets to us? The ghost that appears in a cloud of swirling smoke. In this nun's case, we're sure she'd appear in a cloud of Cathedral style incense smoke. Can you picture it? A sighting like the one we're imagining just might ruin the smell of Frankincense for good. 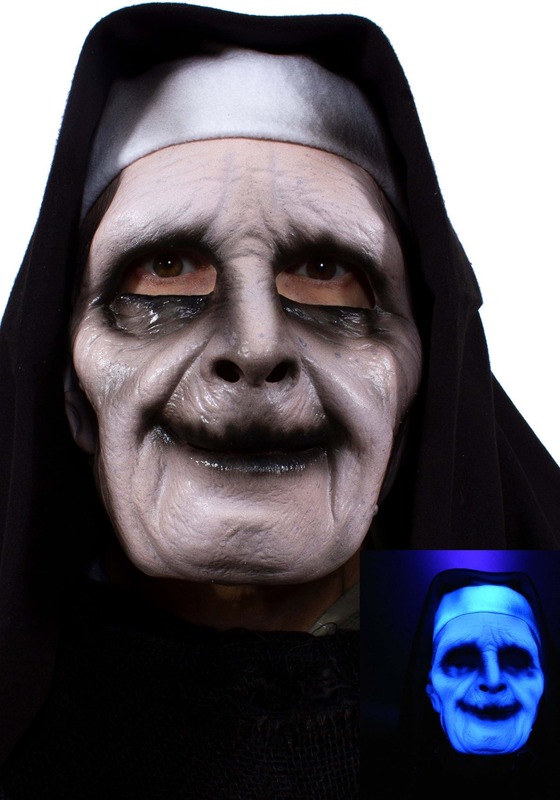 This eerie mask will make you very aware of all your sins. The mask has very pale skin and is detailed with aged lines around throughout. The mouth and eyes are blackened for an eerie image at first glance. And under a black light, this mask is even more shocking! It glows as if it's haunted. The mask is framed in a black habit so that everyone will immediately recognize your haunting religious roots.